Location: Chengdu Shuangliu International Airport is located about two kilometers (about 1.2 miles) east of Shuangliu County, about 16 kilometers (about 10 miles) away from downtown area. Brief intro: First built in 1938, Chengdu Airport is the largest in southwest China. It covers an area of over 9,333,333 square meters (about 2,306 acres) with two parallel runways and 200 parking stands. Currently, it has 143 scheduled domestic flight routes to cities including Beijing, Shanghai, Guangzhou, Qingdao, Nanjing, Hangzhou, Xi'an, Kunming, Xining, Lhasa and Nyingchi. 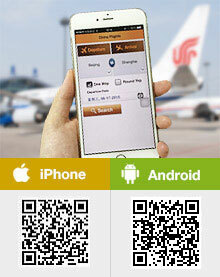 In addition, flights to cities inside the province are available, such as to Dazhou, Xichang and Jiuzhaigou, etc. It also offers 56 international (regional) flight routes by the end of 2012. International flights include service to cities abroad such as Tokyo, Shanghai (Beijing)-Fukuoka, Osaka, Seoul, Bangkok, Singapore, Kuala Lumpur, Katmandu, Los Angeles, Vancouver, London, Sydney, Melbourne (Australia), Frankfort, Delhi and (Beijing)-Paris, as well as regional flights to Hong Kong and Macau. Tips: Tourists bound for Chongqing and places inside Sichuan Province such as Jiuzhaigou must take flights from the old lobby of CTU, a short distance away from the new one. Flights from Chengdu to Nyingchi in southeast Tibet operate only one round trip per week, on Fridays. Tickets are only sold during the week of the trip and can not be reserved for the next week. Passport holders of 53 countries and regions are granted a visa-free stay of up to 144 hours when taking an international transfer via Chengdu Shuangliu Airport. Read details about 144-Hour Visa-Free Transit in Chengdu. Shuangliu International Airport has two terminal buildings, Terminal 1 and Terminal 2, covering an area of 500,000 square meters (about 124 acres). There are 74 boarding bridges, 64 security channels, and 207 check-in counters. Complete and advanced facilities and services are available in both terminals, including International and domestic transfer, VIP lounge, banks, dining, shopping, recreation and other dedicated services. There are several shuttle buses running to the downtown area of the city. It also provides long-distance buses to major cities within Sichuan Province. In addition, Chengdu-Leshan-Emeishan Intercity High Speed Train and Shuangliu Airport - Emeishan Train have a stop at the airport, and passengers can take a train to Chengdu South or East Railway Station in downtown, Leshan famous for Giant Buddha, and Emieshan well known for Mt. Emei. The trains also go to Meishan, Qingshen, Guanghan, Deyang, Mianyang, and Jiangyou. Tips: Passengers can board buses at the area 220 yards (200m) south of Terminal 1. Tickets are sold 5 days in advance, except those to Deyang. Train is easily accessible here for passengers to go to the two railway stations in the city. It takes about 10 minutes to South Railway Station and 16 minutes to East Railway Station. Besides, trains to nearby cities such as Leshan, Emeishan, Meishan East, Qingshen, Deyang, Mianyang are also available at the airport for passengers’ convenience. The ticket office and waiting hall are located on -1F of the parking lot in front of the terminal building 2 and the platforms on -2F. Passengers can take metro line 10 at T1 & T2 of Shuangliu International Airport nowadays. Upon landing, detailed English signs at the airport can help passengers find the metro station easily. This line has stretched to Taipingyuan, Cujin, Huaxing and Jinhua. It costs CNY4 for the whole single trip, opening from 06:00 to 23:00. For passengers who want to visit Chengdu Research Base of Giant Panda Breeding, they can take metro line 10 to Taipingyuan Station, then transfer to line 3 and arrive at Dong Wu Yuan Station. Get out from Exit B and then take bus 198 or 198A direct to the base. The taxi fare is about CNY80-100 from the Airport to North Railway Station, about CNY60 to East Railway Station, and about CNY20-30 to South Railway Station. Usually, you can negotiate the price with the taxi driver. The acceptable bargain price is about CNY50 by taxi to the city center area. Business Center: Located in the Departure Building, which provides photocopying and fax services. Duty Free Shop: Located at the separated area of Corridor A in T1, which mainly deals with tobacco, alcohol, perfume, and decoration items. Lounges: It provides VIP lounges and First Class Seat lounges in both Terminals 1 and 2, with TVs, movies, newspapers and magazines, drinks, snack foods, and other self-service facilities. Train Ticketing Office: Exit 1 of the Waiting Hall in T1. It opens from 08:40 to 18:50. Luggage storage: Luggage storage service is available at exit 1 and 4 of the Domestic Departure Hall in T1; or behind the check-in island N and P in T2. It serves from 05:00 to 23:00. Lost & Found: The lost and found service counter can be found near exit 4 of the Departure Hall in T1, or behind the check-in island P in T2. It operates from 08:00 to 20:00. Hotel: Airport Express Hotel, a four-star business hotel, is located east of T2. Bank: There are Bank of China, Bank of Communications, Industrial & Commercial Bank of China, China Construction Bank ATMs, and Bank of Chengdu. We are not able to find any trains to our destinations. The internet says "not available"--does this mean that the train times are not posted yet? are additional cars being added to the train schedules? If there is no train, how can a traveler get a taxi for that long journey booked in advance? Hi, there is no direct train from the Airport to Emeishan but you can take a train from Chengdu South or Chengdu Railway Station. It is suggested for you to book tickets as soon as possible or they may be sold out. Pls may I know, how to travel above cheapest way. I touch down at 10.45pm. Is there train or shuttle bus going to down town, tq? You can take Shuttle Bus Line 1 to the downtown area, which doesn't stop until 23:59.
i will be landing Chengdu Airport at 02:15am on a flight from Shanghai. Am i allowed to stay in the airport until 06:00am when buses and metro start running again? Yes, you are. Actually, you can also take night shuttle bus. There is no direct bus or train from Shuangliu Airport to Guanghan. Upon landing, take metro line 10 to Taipingyuan Station and transfer to metro line 7 to East Railway Station. After arriving, take the bullet train to Guanghan North Railway Station. How much is a taxi ride from Chengdu Shuangliu airport to the panda research base? Can i catch a taxi at 01:00am? Generally speaking, it costs CNY130 to 140 at that time. As I know, you can still find several taxis outside the airport. Don't worry.